I’ll be honest – I don’t have a very high opinion of horses. Growing up in Nevăda, I never understood the fascination with the equine creatures. They died out in America after the ice age, along with ground sloths, sabertooth cats and wooly mammoths. They used a lot of food and water in the desert, and I always felt like that food and water was better reserved for either cattle or non-invasive species… but not horses. I know this is not a popular opinion. I respect those who have a differing opinion. And I do have a point in bringing this up. 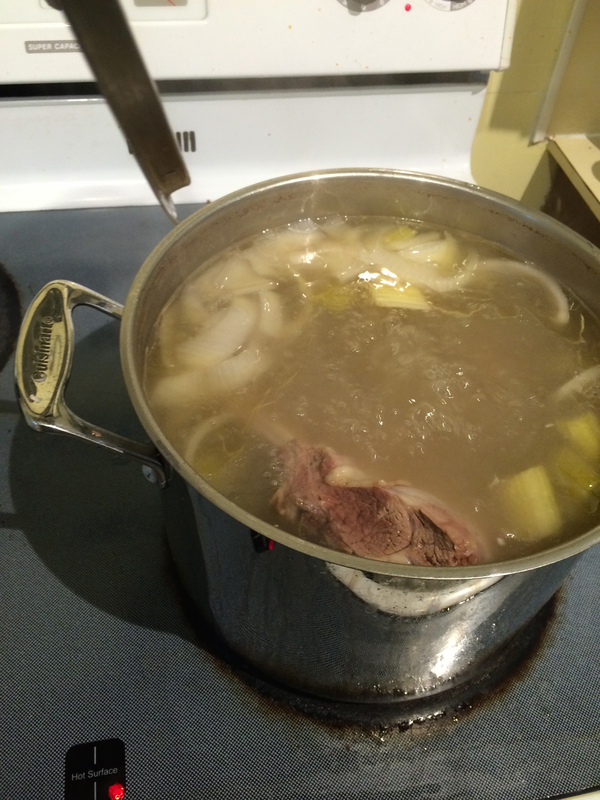 Boil the lamb, onion and celery for a couple of hours. I have no plans to eat horse. Just because I don’t necessarily like something doesn’t mean I want to boil it and eat it. So, for the Kazakhstan episode of this project – beshbarmak, one of the more fun-to-say foods I’ve encountered – I went with lamb. Beshbarmak wasn’t my favorite dish. The broth I tried to make by boiling the lamb didn’t really turn out the way I expected. Maybe it tastes better with horse? 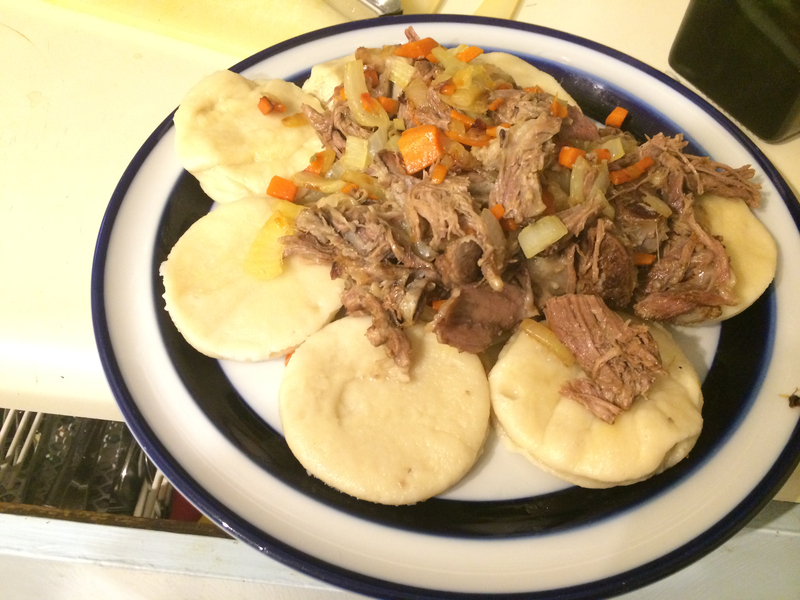 This recipe was sourced from a few sites, including the Peace Corps and Foodista. Round noodles! Boil them in the lamb broth. Marinade the lamb for a few hours in the lemon juice, cumin and salt. Cook the lamb in a pot full of water over medium-low heat, adding sliced celery, sliced carrot and 1/2 sliced onion. Simmer for 2 1/2 hours until meat is tender. After about an hour, mix flour, 1 cup water and 2 eggs. Roll dough into 1/2-inch thick sheets. Set aside in an airtight container. Remove lamb from broth; reserve stock. Separate meat from bones. Sautee onions and carrots until carmelized. Add lamb meat. 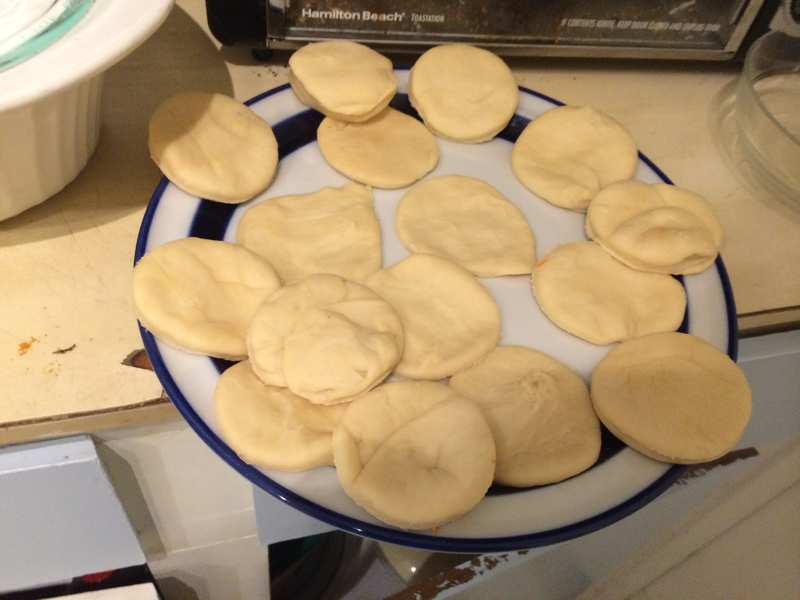 Using a glass or other round object, cut the sheets of dough into circular noodles/dumplings. Thicken about 1 1/2 cups of the sauce and set aside. Bring the remaining stock to a boil, add noodles and cook. Serve by placing lamb on a plate, surrounded by noodles, pour small amount of broth on top, sprinkle with chives. Serve broth separately in small bowls. Lamb. Noodles. Vegetables. No horse.